As Chief Financial Officer, you're tasked with organizing all your company's financial paperwork to protect it from penalties, civil lawsuits, and even criminal charges. All that paperwork - both physical and electronic - can really add up as your company grows, but it's not always easy to know what you need to keep. 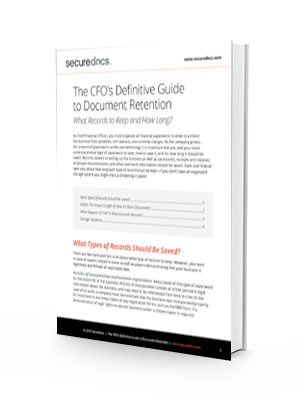 This whitepaper can help you and your team understand what paperwork you need to save and how to save it safely and securely. Start reaping the benefits of an organized, secure office today.